According to this article over on the Seattle Post Globe, work crews were busy last night installing the first of two planned bike boxes in Seattle. I drive past those intersections about twice a week while delivering my daughter to school, although I don't usually get up that way on my electric bike. I will get to see it first hand from my car tomorrow. SEATTLE - To create a safer roadway system and help encourage more bicycling citywide, the Seattle Department of Transportation (SDOT) is today installing the city's first bike box at E Pine Street eastbound at 12th Avenue. This fall SDOT will also emplace these new bike facilities at E Madison Street eastbound and westbound at 12th Avenue, and Seventh Avenue S northbound at S Dearborn Street. 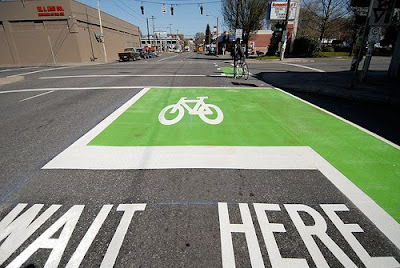 A green box with a white bicycle symbol inside, a bike box is a nationally used intersection safety feature that prevents bicycle/car collisions by placing cyclists at the front of the vehicle queue. The boxes improve safety for all roadway users by increasing awareness and visibility of cyclists; helping cyclists make safer intersection crossings, especially when drivers are turning right and bicyclists are going straight; and encouraging cyclists to make more predictable approaches to and through an intersection. When the traffic signal is yellow or red, motorists must stop behind the white line at the rear of the bike box and cyclists should enter the box itself. When the light turns green, motorists and cyclists may move through the intersection as usual, with cyclists going first. Motorists turning right on green should signal and watch for cyclists to the right, especially in the green bike lane of the intersection. New signage will help motorists and cyclists understand the new roadway feature. No right turns on red are allowed at these intersections. SDOT is installing bike boxes this year as part of its Bicycle Master Plan implementation. These safety features are used in a number of other US cities to include Portland, New York City, Baltimore and Minneapolis. No right turns on red? That may anger a few motorists. I used my electric bike quite a bit yesterday, making trips to the Seattle Department of Planning and Development, the hardware store, grocery store, and a drug store. As always I rode far enough away from parked cars to avoid being killed by a suddenly opened door, which irritates motorists because I'm harder to pass. Left turns always make me nervous. I don't like taking my hand off the handle bar to signal at such a critical juncture and I also don't trust that the cars behind me will see me in all of the clutter. I usually find a way to turn left without having to play Russian Roulette, even if I have to pull over and use a cross walk. I have also noted that some motorists don't appreciate it when a cyclist goes to the front of a line of waiting cars. They often gun their engines and blow by in a huff. Hopefully these bike boxes will let them know that it's legal for bikes to do that just as it's legal for pedestrians to stop cars at cross walks.